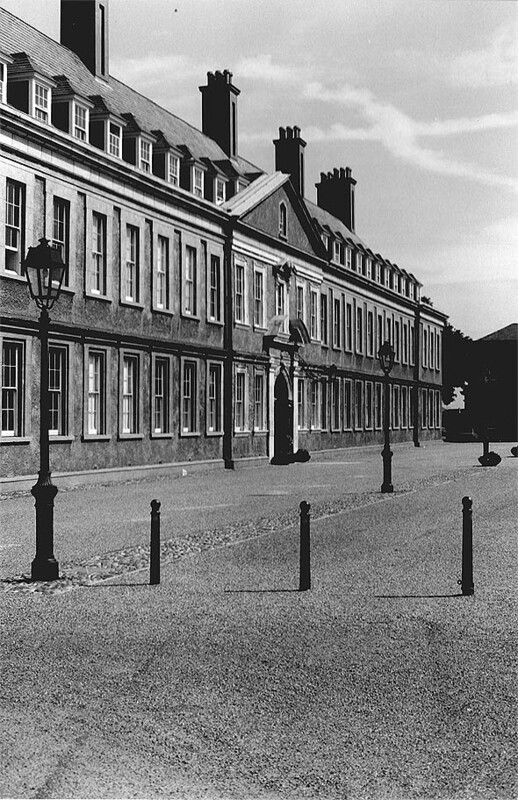 The Royal Hospital Kilmainham is a mile and a half west of the city centre and at the time of its construction the site was part of the Phoenix Park. 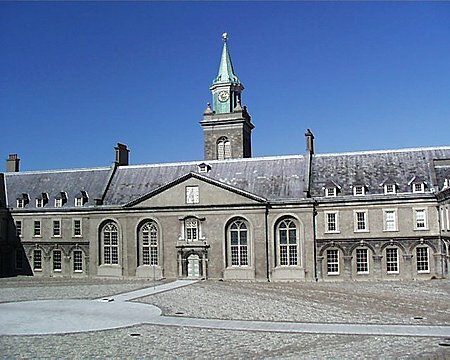 Designed as a home for invalided soldiers, the Royal Hospital at Kilmainham was the first major public building to be constructed in Dublin. Based on Les Invalides in Paris, the building consists of four unbroken ranges enclosing a courtyard. 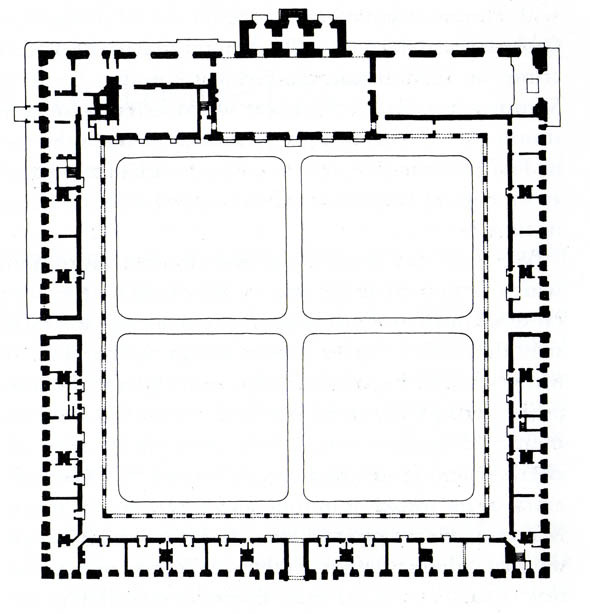 It is similar to Les Invalides in its purpose, the adoption of a closed courtyard plan with arcaded walks corresponding to passages on the floors above. Two years after construction of the Royal Hospital started, Sir Christopher Wren began a building with a similar purpose at Chelsea. 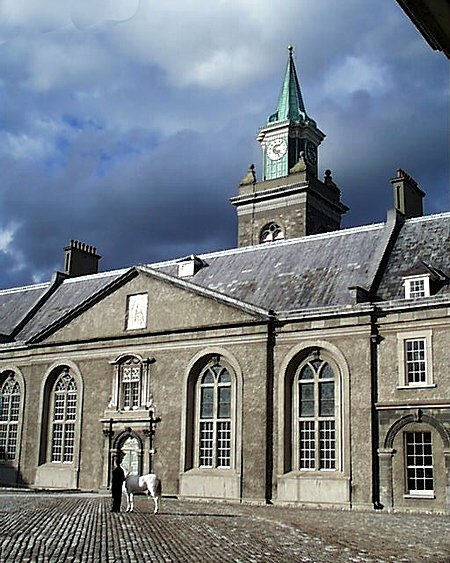 The northern side of the Dublin building contains the dining hall and chapel and is marked by the clocktower and spire. The chapel is expressed externally by the large stained glass window as seen in the illustration above which breaks through the main cornice of the building. The ranges are two storeys in height with a further dormer storey. Even at the time of its construction it was felt to be an important and impressive building with one commentator of the time suggesting that the hospital and the university (Trinity College) exchange buildings. The placing end to end of the chapel and great hall is ceremonial. The hall is placed centrally on the north range with the arcade being broken to accommodate it. The tower is positioned outside of the main structure breaking through the roof of the pedimented entrance to the great hall. It has three stages, the base, an octagonal stage and the spire which has handles much like those that James Gibbs placed at St Martin-in-the-fields in London in 1722-26. Here Robinson was doing it as early as 1701. The interiors of the building are largely destroyed by the building’s conversion into an art gallery but the interiors of the chapel and main hall are still intact. For a time the quadrangle was used for storage of old statuary of British monarchs that were removed from public spaces in Dublin after independence. A statue of Queen Victoria that came from the front of Leinster House, was stored here for many years before being sold to the city of Sydney in Australia. After lying empty for many years, the building has been refurbished and is in use as the Irish Museum of Modern Art (IMMA). A new foyer and bookshop area was constructed within the external fabric of the old building and this contains a magnificent glass and steel staircase. 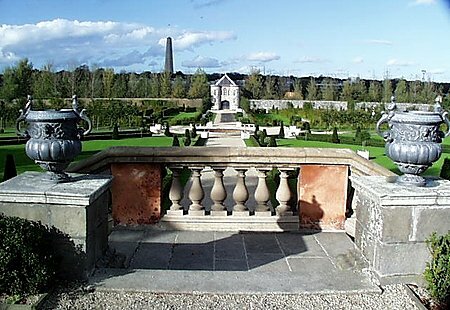 To the north of the building lie the recently restored formal gardens.